This story is part of ESPN The Magazine's Oct. 31 NBA Preview Issue. Subscribe today! Climbing back toward the top, the Blues regained fans' approval this year and found the No. 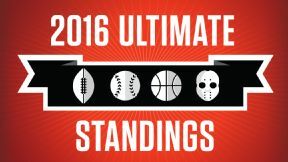 29 spot on the Ultimate Standings list. Ranked 11th overall in 2014, the Blues took a hit and dropped to No. 43 last year. But after finishing second in the Central Division and third in the NHL with 49 wins -- not to mention putting on a show at the end of May -- fans responded with a standings jump. As we have for the past 13 years, we asked fans to vote on their favorite teams, then ranked all 122 sports franchises from top to bottom. Last season proved to be the Blues' ode to fans, as the team regained good graces in St. Louis. Jumping eight spots to No. 18 in fan relations, the Blues allow everyone to feel that St. Louis pride at every home game. From the BMO Harris Bank Kids Captain program to the #BlueSocial program, the Blues understand how to keep the fans entertained and engaged with the team all season long. Best of all, the fans coined the Blues one of the most desirable bang for the buck categories, sliding into No. 23 on the Ultimate Standings list. Unfortunately, the fan relations and low ticket prices aren't enough to keep the crowd pleased with the overall experience at Scottrade Center arena. Ranking as one of the worst stadium experiences in the NHL at No. 82, the Blues can't seem to find the approval of the fans when it comes to the 22-year-old stadium. Lacking in what fans deem "uniqueness," the versatility of the stadium -- it also hosts concerts, wrestling matches, NCAA basketball and more -- seems to be the Blues' gift and curse. The biggest takeaway for most Blues' fans is that they aren't getting enough hockey vibes inside the arena -- only six teams scored worse when fans were asked if they "had a great stadium." Although the Blues' loyal fan base still craves a Stanley Cup finals berth, the Blues proved to be a strong force in the NHL last season. Moving up 22 spots to No. 58 for coaching and 31 spots to No. 54 for players, the Blues also found their rhythm on the ice. St. Louis had fallen to No. 80 in coaching last year, due in part to fans' lack of trust in Ken Hitchcock's ability to lead the group to a Stanley Cup, but now they've turned things around and even made an appearance in the Western Conference finals last season. This season will prove to be a test for both Hitchcock and the younger players, especially with the absence of clutch veterans Troy Brouwer and David Backes.